Here’s a lovely old picture with a tenuous Hadleigh connection. It was given to the Hadleigh & Thundersley Community Archive for safe-keeping after the death of Mrs Joyce Bardell, one-time landlady of the Crown Hotel, Hadleigh High Street. Joyce (née Francis) was married to Jack Bardell (a mechanic who worked at her father Sid Francis’s motor garage at the Crown). Later, Joyce and Jack took over the running of the Crown from Sid and his wife, Mary (née Lincoln). The Crown was the Francis family business for 125 years. We were told that the train driver is Jack Bardell’s grandfather. My old Hadleigh school friend, Nigel Seaman (who is an awesome Railways Buff) was able to volunteer us quite a bit more. He answered the first puzzle quite quickly, working out the location as Brentwood, Essex. (This he corroborated by cross-referencing another photograph in a published railway book.) The photographer’s purple stamp on the back of the pasteboard had provided supporting circumstantial evidence: “Rayner-Green, Photographic Artist, Cresent Road, Brentwood, Essex”. Nigel writes: There was a small engine shed at the eastern end of Brentwood Station. 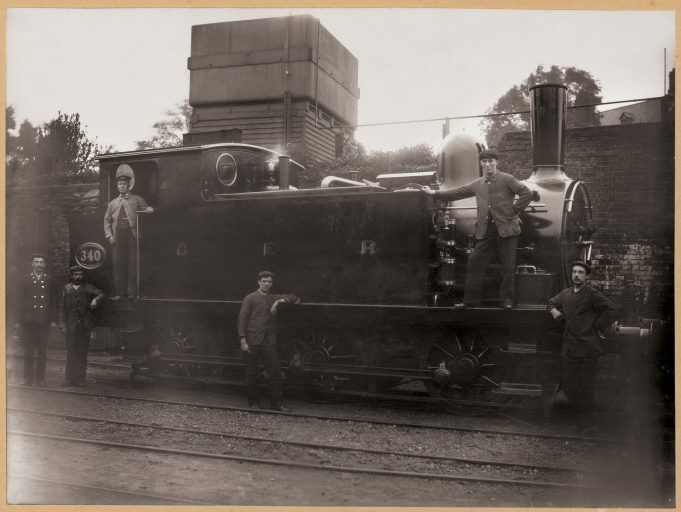 The locomotive is a Great Eastern Railway engine built in 1890. By its fittings and paintwork, it looks very new indeed, so I put the date at 1890-1891. This checks OK with the building behind it. It is obviously a posed professional photograph for either the benefit of the six men, or maybe the GER. The two on the engine are the driver and firemen, dressed as of the period; three of those standing are engine shed fitters/cleaners, and the fourth (extreme left) is a guard in his GER railway uniform. There’s further scope here for someone with a penchant for genealogy to do a bit more delving! Any Bardell relatives out there? We’d love to here from you. The original photo measures 153mm x 205mm (6” x 8”) and is pasted onto the original mount-board. It had once been framed in a 10” x 12” frame. It is badly faded and has been restored digitally.